Simple, easy to understand legal knowledge to protect your financial future. The information in this book comes from handling truck accident cases over many, many years. Ohio Truck Accident Claims: What You Need to Know, authored by Ohio truck accident lawyer David M. Chester. This new consumer handbook provides answers on handling truck accident claims in Ohio. When you or someone you love is injured by an 18-wheeler or similar vehicle, lawyers call this type of case a trucking case or trucking accident case. Trucking accidents are different than other types of motor vehicle accidents and therefore, handling trucking cases is very different. Handling an Ohio trucking accident case involves the intersection of federal trucking law with many state law causes of action, and involves the use of accident reconstruction experts, trucking experts, medical experts, very specific evidence collection from the trucking company, many different defendants to sue, and other facts that require an experienced Ohio truck accident lawyer. The area of truck accident claims handling is a very specialized field of legal practice. You will read in this very important and informational book by attorney Chester how trucking accidents are different from normal motor vehicle cases and how differently they must be handled. Attorney David Chester wrote this book as if you were a potential client, thinking about calling him or actually sitting in his office talking to him about the truck accident claim process. Much of the information from this book comes from the handling of truck accident cases over the many years of experience that attorney Chester has had as an Ohio truck accident lawyer. He has tried to anticipate your questions in this book by drawing on the questions his clients have asked over the years. 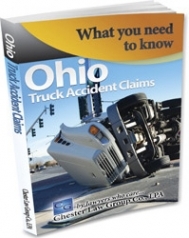 Click the button below to get this free book, "Ohio Truck Accident Claims: What You Need to Know" today!